From the multi-million-copy bestselling author of Wicked comes a magical new twist on Alice's Adventures in Wonderland, published to coincide with the 150th anniversary of Lewis's Carroll's beloved classic When Alice toppled down the rabbit-hole 150 years ago, she found a Wonderland as rife with inconsistent rules and abrasive egos as the world she left behind. But what of that world? How did 1860s Oxford react to Alice's disappearance? In this brilliant new work of fiction, Gregory Maguire turns his dazzling imagination to the question of underworlds, undergrounds, underpinnings — and understandings old and new, offering an inventive spin on Carroll's enduring tale. 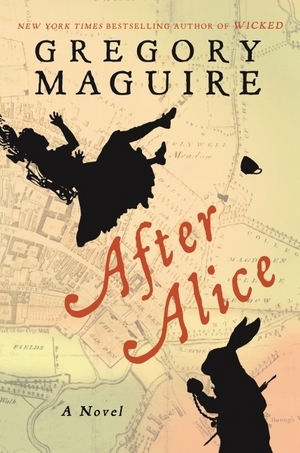 Ada, a friend of Alice's mentioned briefly in Alice's Adventures in Wonderland, is off to visit her friend, but arrives a moment too late — and tumbles down the rabbit hole herself. Ada brings to Wonderland her own imperfect apprehension of cause and effect as she embarks on an odyssey to find Alice and see her safely home from this surreal world below the world. If Euridyce can ever be returned to the arms of Orpheus, or Lazarus can be raised from the tomb, perhaps Alice can be returned to life. Either way, everything that happens next is After Alice. Well, this one was a flop. It was just OK. I was going to give 3 stars, but then the ending, ugh. 2 stars it is.